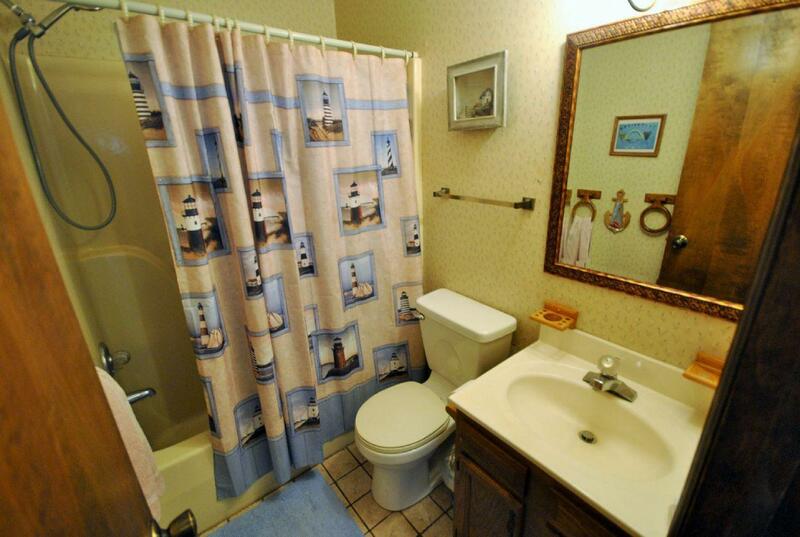 This property has had 35 views in the last 3 days! 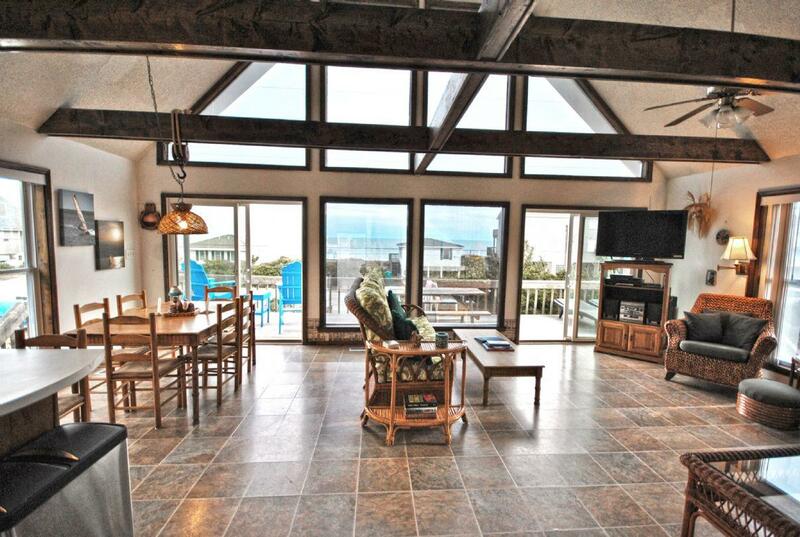 "1 Grandview", a contemporary second row Cape Cod style home, features breathtaking, unobstructed views of the ocean with seamless beach access. Enter through the covered carport, complete with outdoor shower and backyard picnic table, into the laundry room and venture up the stairs into the main living area. 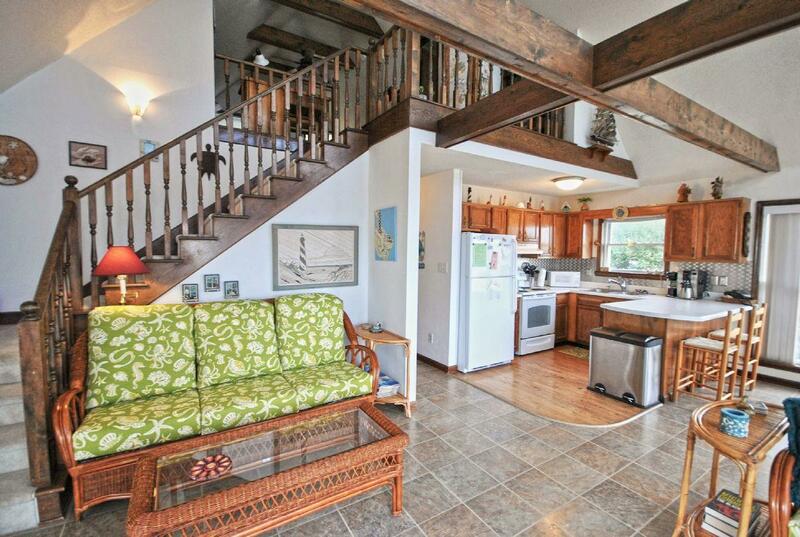 Here you will find an open floor plan. 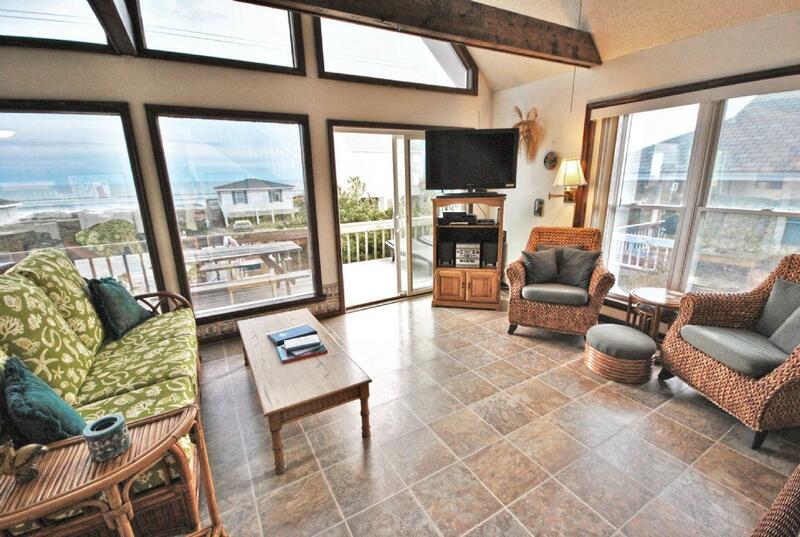 Enjoy beautiful views from the full wall of windows and a sliding glass door leading to the picturesque sun deck. This outdoor living space offers ocean views, high-top table for dining alfresco and chaise lounge chairs for soaking up the sun. The living area features a fully equipped kitchen with breakfast bar, large dining table ready for your family meal and a cozy living room. 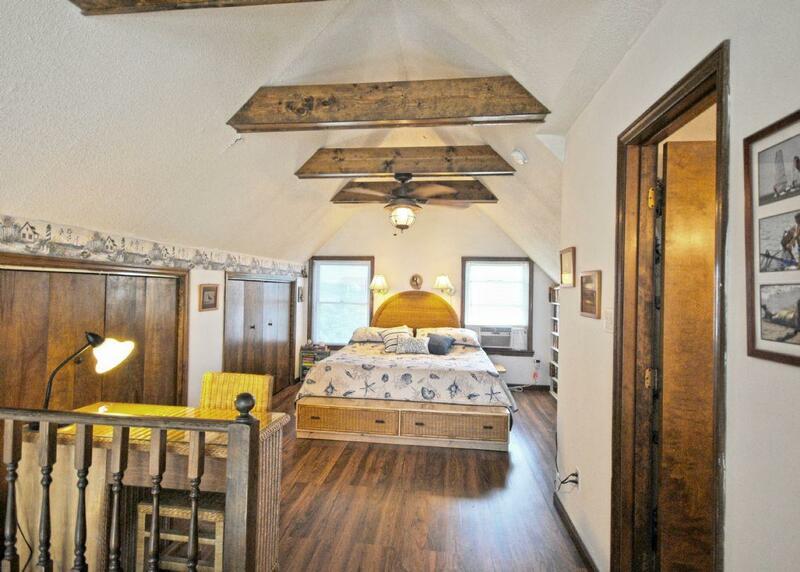 The peaked ceiling with exposed wooden beams gives light and height to this fabulous home. For your entertainment, "1 Grandview" provides TVs located in every room and has a huge video library to select from for any evening you want to curl up, unwind and watch a movie. 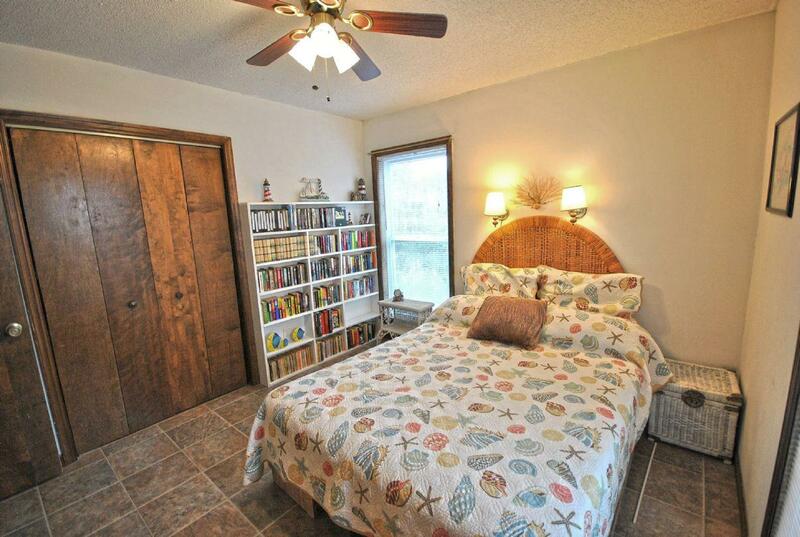 Located at the back of the home are two bedrooms. 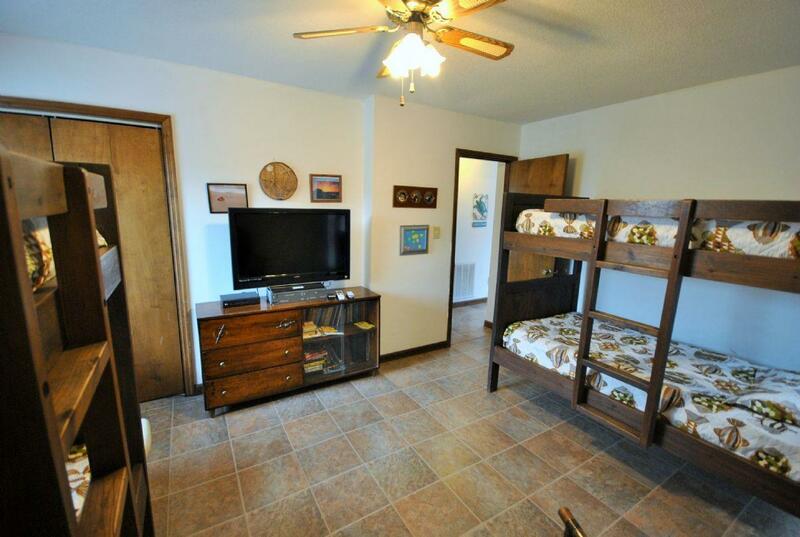 Bedroom one has a queen bed and bedroom two has two twin bunk beds. 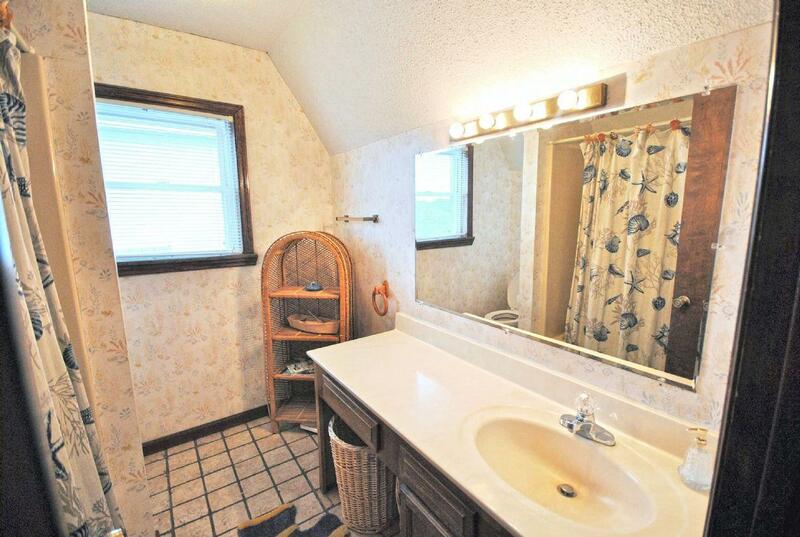 These two bedrooms share a bathroom off the hallway. 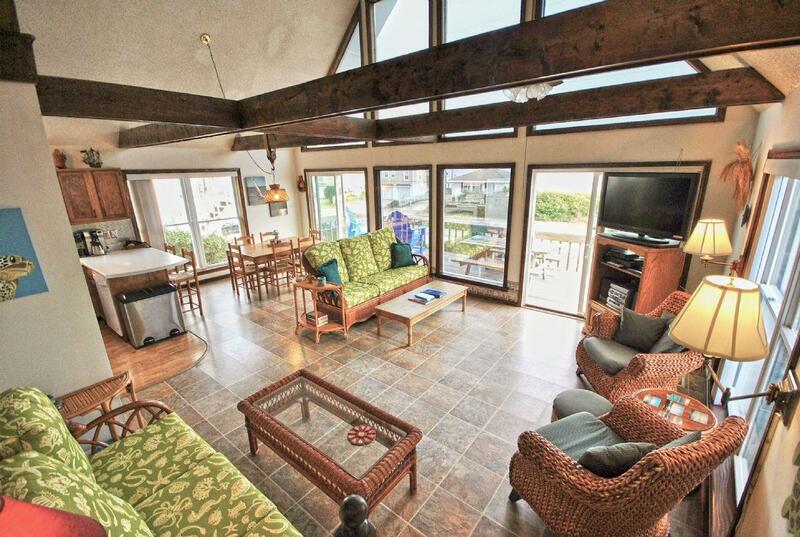 Above the main living area, you will find the master loft. This loft is an incredibly unique place to stay. 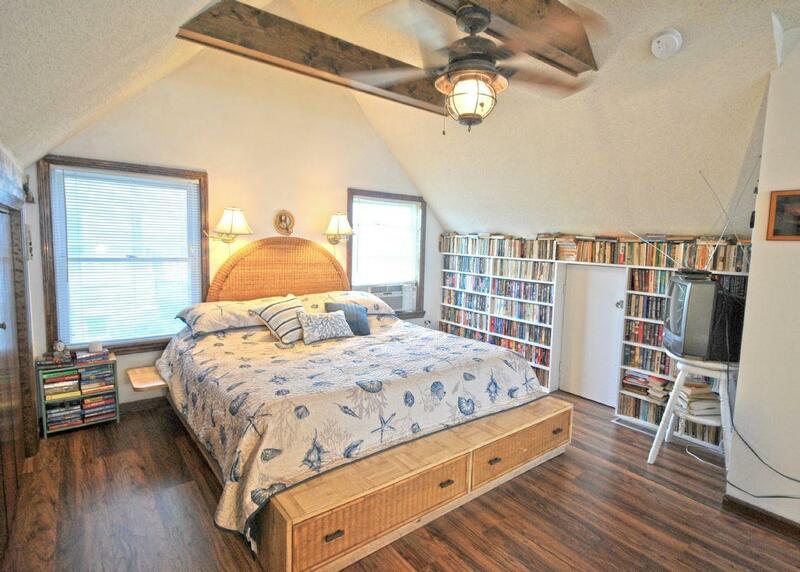 With a brand new king bed, stocked built-in book shelves and a private full bathroom, this bedroom offers a cozy yet open feel at the same time. 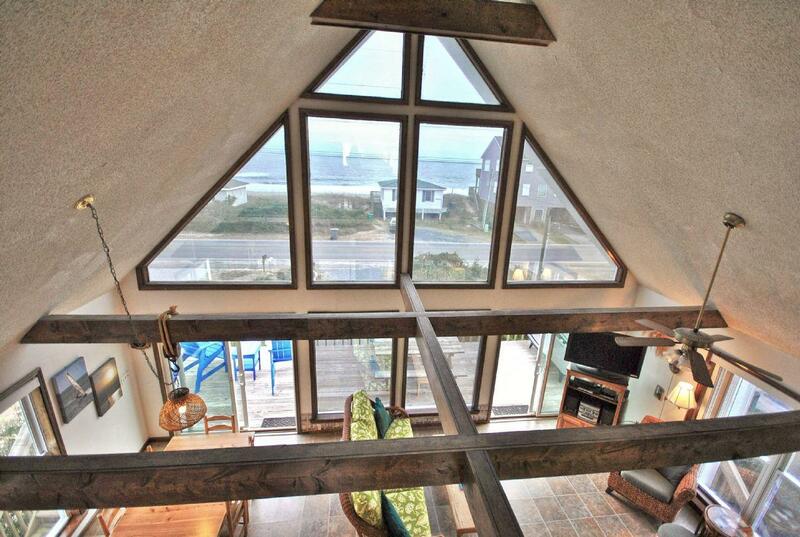 Being a loft, this enables the Guest to have a stunning ocean view out of the upper windows of the peaked roof. "1 Grandview" is just that! You simply cannot go wrong with this charming home. We had a wonderful time!!! Hoping to come back next year! "Beautiful home with easy access to the water!" "We had a great week at the beach...The house could use some updates, a little paint would go a long way...The kitchen was stocked well with dishes,cups, pots/pans and so forth....The upstairs loft was nice, I liked the bed no issues sleeping on it at all...And if you need something to read there are probably 200 books up there to pick from...There are a lot of extra blankets and pillows, toys for the kids in bunk room...and extra beach chairs and boogie boards to use...We loved the high chairs on the deck, your view was not of the rail but you could actually look out and see the ocean...TV's in every bedroom and living room just in case you have a rainy day...Beach access is just 2 house down, very easy...Plenty of parking space....We had an awesome week and would stay here again....Wish they had another outside trashcan and recycle bin... they only get picked up once a week and one is just not enough..."
"Nice house. Very short walk to access. Not too crazy about the waterbed (which needed water) in loft area, but I still slept good. Great view. Love the open layout of the house. 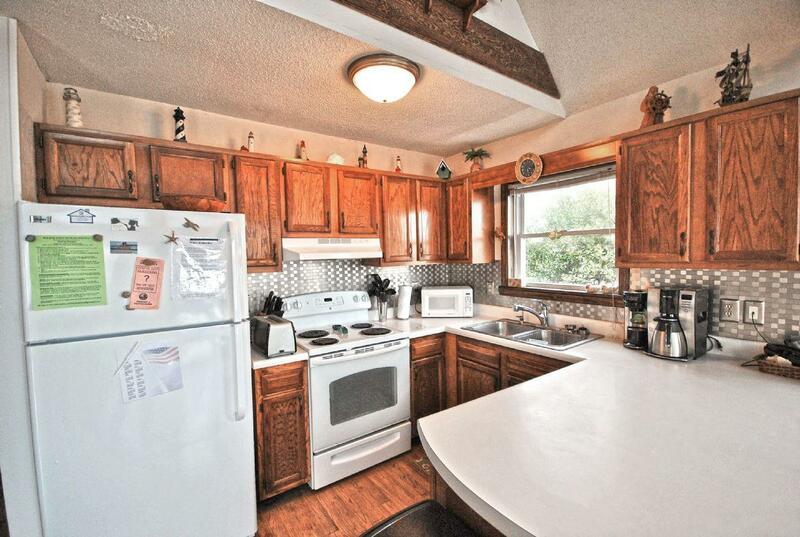 Kitchen had everything we needed." "Loved this place! It was a great view and we loved leaving the doors open at night and listening to the waves! It was perfect for our family vacation! Only suggestion is updating the waterbed! It was a little uncomfortable sleeping in! Other than that loved it!!" Great house with amazing views! "This property was worth every penny. The views were great and morning coffee on the deck a must! The kids loved everything the house had to offer. I fully intend to come back again! probably for a longer stay!" Great location and wonderful house! "My family and I had a marvelous time staying at the "Grandview" for our summer vacation. The description of the house is quite accurate. There was ample room in the common area where we spent most of our time. The view from the master bedroom was beautiful. 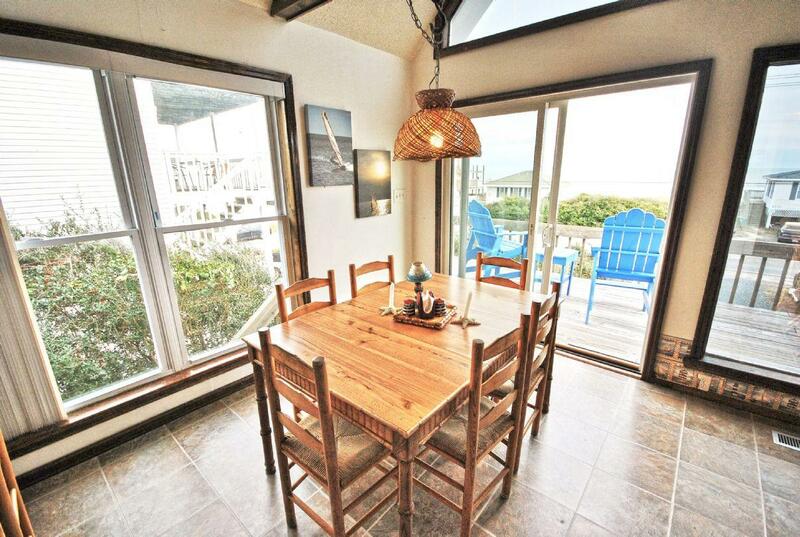 It's one of the few 2nd row homes in Surf City that has an unobstructed view of the ocean. We spent a lot of timeon the front balcony which had a great view of the ocean too. Also, there were plenty of indoor and outdoor toys for kids. 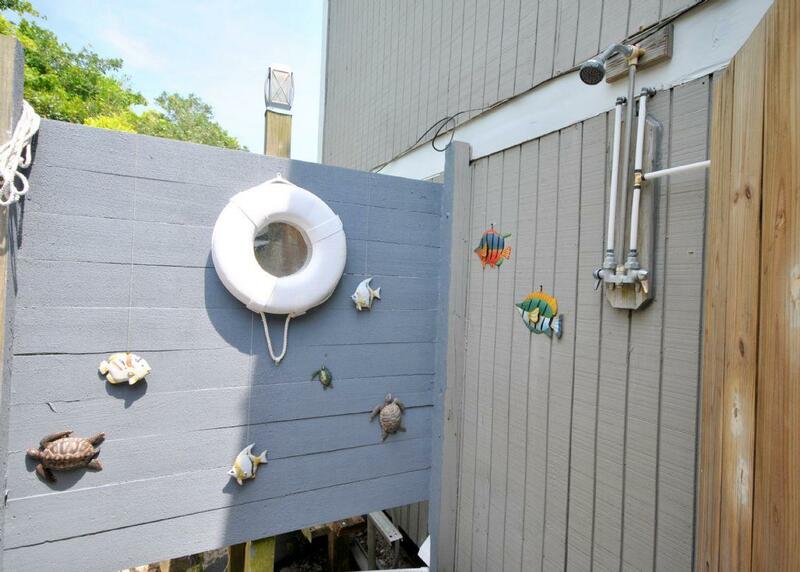 Toys included: boogie boards, sand buckets, sand shovels, etc. All the appliances were fairly new and the furniture had that "beachy" vibe. The bunk beds in the kids room was a bit rickety but worked out fine. They do have a large collection of VHS tapes and a small collection of DVDs. 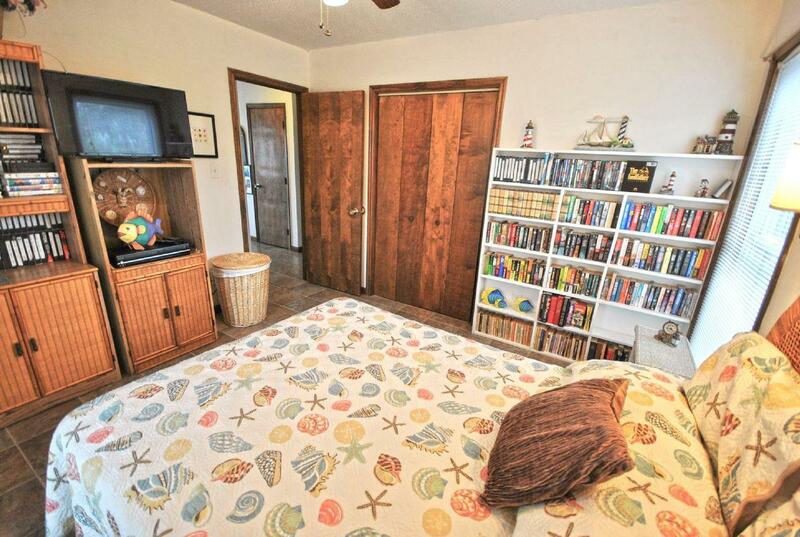 Every bedroom came with a flat screen tv and either a DVD/VHS player or Satellite TV. Wifi was fast too! 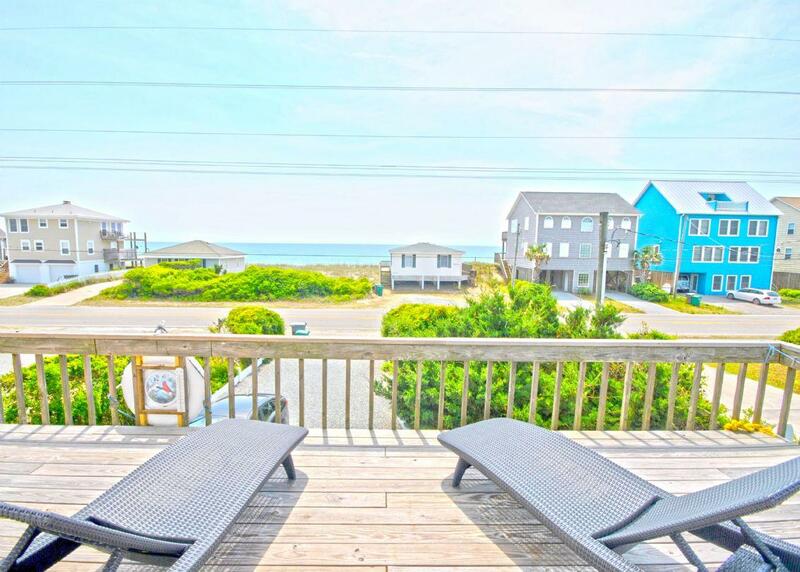 Topsail Island is the perfect place if you want a nice, relaxing vacation without a lot of tourism. We ate at a couple of the areas restaurants though they do get really busy during the dinner time hour. Restaurants that we tried: The Beach Bunny: this is a great place if you want a nice sandwich and fries. We were seated immediately with no wait. Daddy Mac's Beach Grille: tasty seafood fare; we arrived around 6pm and waited 45 minutes to be seated. The management company, Access Realty did a great job with customer service. They were friendly all the times I spoke with them and would answer emails within an hour of contact. I would definitely rent with them again." "Nice house, a bit dated, but nothing horrible. Some small cosmetic work would go a long way, but hey, if you want 5 stars you have to be willing to pay for it! The bed in the loft is a soft-sided waterbed, which we weren't prepared for (neither were our backs). I think the water tubes needed more water. 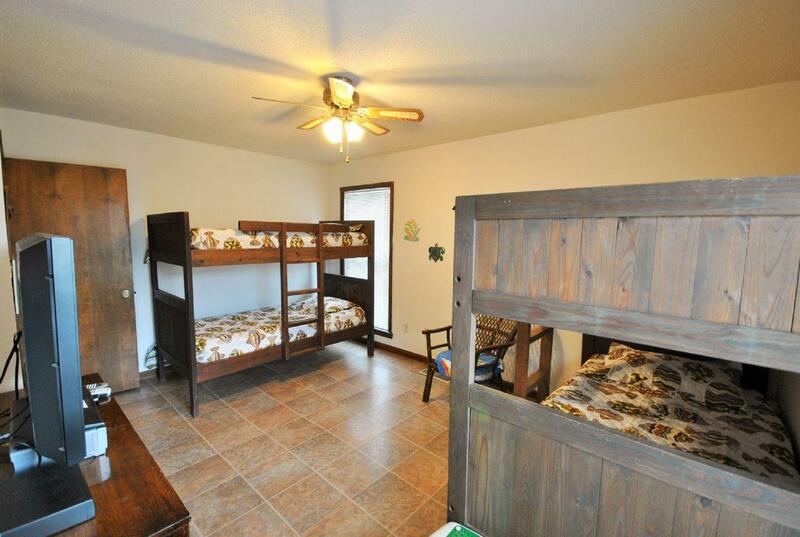 The bunkbeds in the kids room were a little shaky, but fine as long as the kids aren't climbing and playing on them. The pictures provide a very accurate idea of what you will get. Everything was clean. There were lots of dishes, glasses, silverware, cooking items available. The view: Amazing. The location: Perfect. 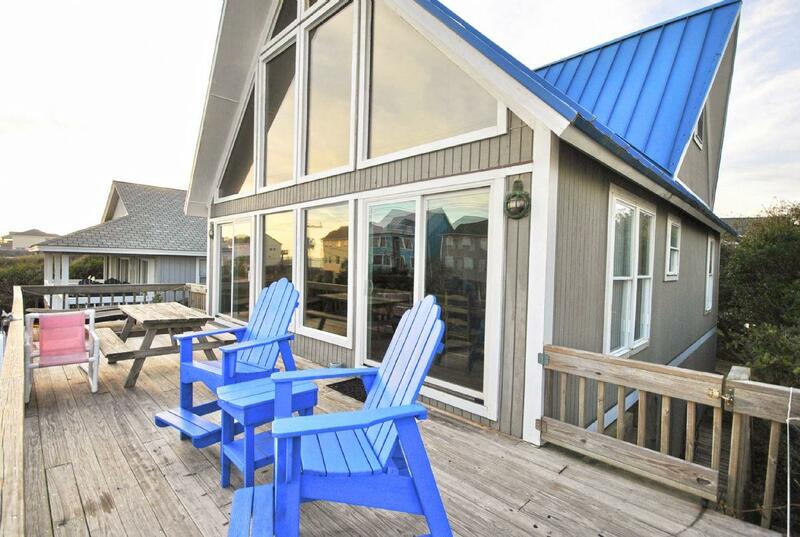 We had looked at beachfront homes, and the prices were significantly higher. This was very convenient with beach access 4-5 houses down. No big deal at all. Also, we noticed that this was one of the few (and possibly ONLY) second row homes that actually had a view of the ocean. The large deck was inviting to sit on. Even when it rained, the view with all of the full glass windows didn't make you feel closed in. If you are looking for a vacation spot that's full of life and entertainment, this isn't for you. If you are looking for a place to relax, with a little bit of tourism without all of the commercialism, you will like this area. The Karen Beasley Sea Turtle Hospital is a must. Unfortunately, it rained a lot while we were here, so it was very crowded as everyone seemed to be getting bored being stuck inside for a few days. There is also a very small arcade which the kids enjoyed (they were a little disappointed there weren't any tickets to trade in for prizes), and we managed to get out spending only $6/kid. Younger kids will enjoy the many playgrounds on the island. My kids are 15, 11, and 9...so it's not easy to find places they all enjoy, but between restaurants, shops, the beach, etc everyone had a good time. Wilmington is a short drive away, well worth it to visit for a day. The USS North Carolina was fantastic and the town itself very eclectic with something for all ages."